Saakashvili is also prohibited from holding public office for 1.5 years. Georgia's Tbilisi City Court in absentia sentenced ex-president Mikheil Saakashvili to three years in prison for abuse of power. The court's press service said in a release that the ex-president was found guilty of "abuse of official powers against public interests, which led to a significant violation of the rights of individuals and the legitimate interests of the state." The trial was on charges the abuse of power and illegal pardoning in November 2008 of ex-officials of the Department of Constitutional Security sentenced for the murder of Sandro Girgvliani, a banking worker. The Girgvliani case in 2006 became one of the loudest processes in Georgia as former Interior Minister Vano Merabishvili, Head of the Department for Constitutional Security Data Akhalaia and other high-ranking law enforcement officials were involved in the killing. Girgvliani was discovered dead in a cemetery outside Tbilisi. In 2006, a court sentenced four high-ranking policemen to 7 to 8 years in prison. Three years later, they were released on parole after they sentences were reduced by half by the decision of President Saakashvili. After the change of power in Georgia in 2012, the former head of the Interior Ministry, former prime minister Vano Merabishvili and several other high-ranking officials were brought to justice. Merabishvili was sentenced to three years in prison for falsifying an official document. The former head of the Department of Constitutional Security of the Interior Ministry Data Akhalaya, who, according to the investigation, ordered the killing of Girgvliani, fled Georgia and is on the wanted list. According to the investigation, Saakashvili abused his official powers by promising to the now-wanted Akhalaya and cut the terms of the imprisoned ex-officials by half in bypass of the official pardoning commission. After that the convicts were released on parole. Tbilisi court also consider criminal cases against Saakashvili on the charges embezzlement of public funds, order for the violent dispersal of the opposition rally in 2007 in Tbilisi and the seizure of the building of Imedi TV. Earlier, a court ruled on the arrest and pre-trial detention of Saakashvili if he appeared on the territory of the country. 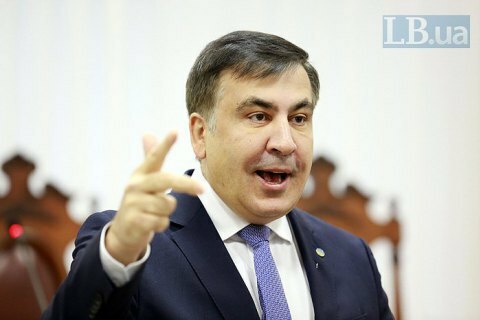 The Georgian Foreign Ministry did not contact Ukraine regarding the detention of Saakashvili.